Inhale the wonders of a tropical dawn drenched in the dream of rustling palm trees and a sultry sea breeze. Living Libations Tropical Best SkinEver™ anoints every stratum of your skin with the tropical botanical beauties of fresh Tahitian gardenia flowers infused in volcanic coconut oil, where Hawaiian sandalwood sanctifies the senses, juicy jasmine saturates in turmeric’s tender embrace, and lemon, vanilla, and ylang burst in beatific bouquets of tropical wonder. This is your Best Skin Ever – beach-style. Inhale the wonders of a tropical dawn drenched in the dream of rustling palm trees and a sultry sea breeze. Living Libations Tropical Best Skin Ever™anoints every stratum of your skin with the tropical botanical beauties of fresh Tahitian gardenia flowers infused in volcanic coconut oil, where Hawaiian sandalwood sanctifies the senses, juicy jasmine saturates in turmeric’s tender embrace, and lemon, vanilla, and ylang burst in beatific bouquets of tropical wonder. This is your Best Skin Ever – beach-style. Living Libations Tropical Best Skin Ever™ is a luscious Tahitian love-dream. The joyful aroma of being on a tropical beach is within reach. Experience the freedom, relaxation, and deep restoration of a sandy saunter on a tropical island, where the salty sea and shimmering sun kiss pure-plant infusions of exotic merriment. It is here that your skin is free to take heed, to restore, to become plump and playful once more. We begin with a special supercritical extraction of Coconut oil, drawn from the thick, succulent pulp of Sri Lankan coconuts. This creamy, buttery, fragrance boasts beneficial moisturizing gifts. Next up along the path, juicy Jasmine Grandiflorum sinks deep into Pleasant palmarosa is distilled from a tropical, fragrant grass resulting in an aromatic oil that smells like a lemony-geranium-rose and is simply splendid for the nose! This formidable skin rejuvenator is rich in mighty monoterpenols, emollient esters, loving linalool, and generous geraniols. It is packed with beneficial botanical compounds. 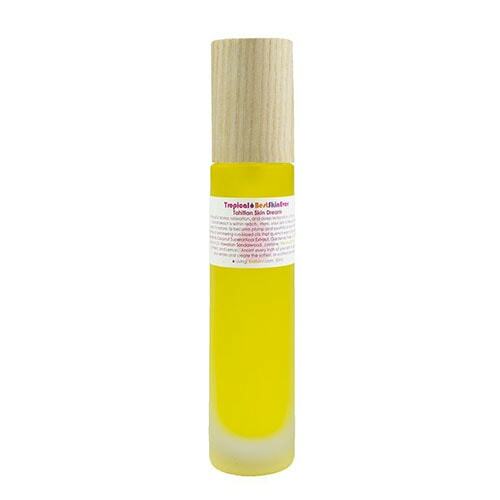 This potent oil tones and rejuvenates the skin. It is used to support radiant skin and to achieve balance between oiliness and dryness. Virgin Coconut; the loyal lover of pure Tahitian Gardenia. By now your skin is positively drowning in opulent amounts of moisture, fatty acids, and luscious lipids galore! But wait, there’s oh-so-much-more! Beyond Coconut, Jojoba, Hawaiian Sandalwood, Jasmine Grandiflorum, and Gardenia Tiare lies a skin-healing bath just at the end of this palm tree-lined path. Follow your nose and sandy toes to pure, organic infusions of Turmeric, Vanilla, Ylang, and Lemon. This is your Best Skin Ever ticket to paradise! . Using your fingertips, gently massage the face, neck, or body. Apply after bathing, swimming, sunning, or showering. It is also a glorious massage oil. Beautiful for after sun rehydration. 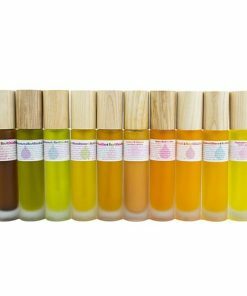 Combine with other Serums, Elixirs, and Essential Oils to create your own unique blend. It may be used to cleanse the face and body, though unbalanced or acne prone skin will see happier results from Seabuckthorn, Rose, Frankincense, Sandalwood, or Neroli Best Skin Ever. Our Best Skin Evers renew the face and bedew the body and with grace. These all-in-one botanical blends cleanse, moisturize, and nourish the skin. Best Skin Evers are crafted to bring into balance all skin types. Washing the face with pure pressed plant oils is an ancient Ayurvedic and gracious gypsy method to cleanse and gently exfoliate the skin. Nadine designed the Best Skin Evers to be your finest bathing and beauty aide. These oils plus water and a cloth are the simple essentials to cleanse, exfoliate, moisten and bedew. Wet a small portion of a cloth with water. Apply one to two squirts of any of the Best Skin Evers (Seabuckthorn, Sandalwood, Rose, Frankincense, or Neroli), to the dampened portion of the face cloth. Gently massage the face, neck and back of the neck with the moistened cloth. Wash gently or wash vigorously for a deeper exfoliating effect. Rinsing the face is optional. 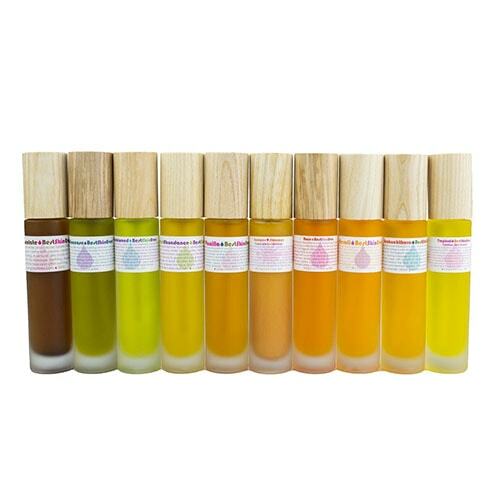 If more moisture is needed, add another squirt or two of any of our Best Skin Evers or Libations Serums (Rose Glow, Soothsayer, Royal Rose, Sandalwood, Chocolate Karat, or Open Sky) to your fingertips and massage into the face and neck. If your skin feels extra thirsty, a Libations Crème (Sundew, Rose Glow, All Seeing, or Maverick) will satisfy. You can also add a drop or two of any of the Serums to a dab of any of the Crèmes. They all blend beautifully together. Leave the body wet after a bath or shower. Wet a washcloth with water. Squeeze it out. Apply a few squirts onto the wet washcloth of any of the Best Skin Evers. Massage the entire body with the cloth, head to toe. Rub more vigorously to exfoliate. Coconut Supercritical Extract (Cocos nucifera) – This sumptuous extraction is a creamy, nutty, buttery celebration of pure, mouth-watering coconut. Captured from the fat, juicy pulp of Sri Lankan coconuts, our concentrated concoction is a secret favorite of perfumers. The special extraction process creates a creamy fragrance reminiscent of a frothy coconut libation. The aromatic profile is thick, tropical, and bold, with dry-down hints of pralines and beach vacations. Coconut is packed with beneficial fatty acids to revitalize and moisturize the skin, including lauric acid, myristic acid, palmitic acid, and caprylic acids. 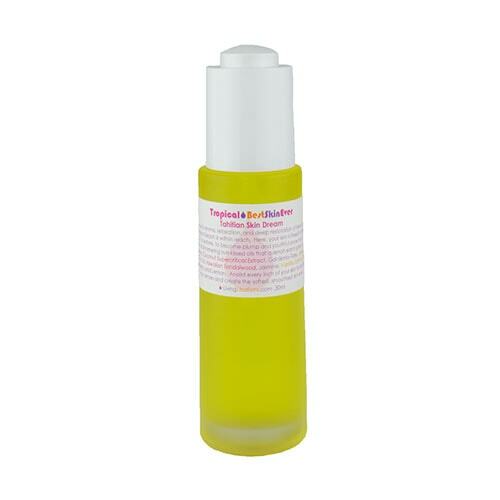 Jojoba Oil (Simmondsia chinensis) – Glorious, golden jojoba nourishes and conditions thirsty skin. Jojoba has unparalleled ability to moisturize the skin, balance oil production, deep clean pores, and create long-lasting conditioning effects that soften skin to perfect silk. It is packed with peptides and lipids and contains the highest levels of phenolic compounds found in nature, not to mention tocopherols, antioxidants, and all soluble forms of vitamin E! Virgin Coconut Oil (Cocos nucifera)– Our pure, pristine virgin coconut oil satiates skin, offering magnificent moisture and resilience. Coconut oil is smoothes the appearance of fine lines, and is a sentinel for the skin’s moisture barrier. 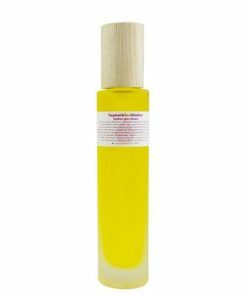 Hawaiian sandalwood Oil (Santalum paniculatum) – Hawaiian sandalwood oil is sensual-smelling, moisturizing manna for the skin. It’s restorative for the planet and the spirit. This steam distilled sandalwood dream is only harvested from trees that are naturally nearing the end of their life cycle. Even better, 20 new trees are planted for each one harvested. The woodsy, nutty, dream-cream oil offered by ancient Hawaiian sandalwood trees is known as a sacred love liniment. Unlike regular sandalwood, Santalum paniculatum has distinct volcanic notes that conjure images of island mountainscapes, lapping blue waves, and thousands of acres of thriving, glistening trees. Just like classic sandalwood, this tropical sandalwood, has skin-loving compounds in the oil to deliver opulent amounts of moisture to thirsty skin. Jasmine grandiflorum Essentail Oil (Jasminumofficinalis grandiflorum) – Jasmine grandiflorum is traditionally used to improve the appearance of scars, spots, and imperfections. This tantalizing tropical perfume adds a full bloom love liniment that lifts the spirits and ignites the heart towards love and happiness. Worries are scattered to the earth’s four corners with a single inhalation of this precious Poet’s Jasmine. Vanilla, Tahitian Essential Oil (Vanilla tahitenis) – This supercritical extract of Vanilla Tahitian essential oil is our yummiest vanilla oil ever and is great for creating silky smooth skin from head to toe! With the added benefits of the natural botanical components of heliotropin and diacetyl butanedione, Tahitian vanilla is more potent and more delicious than the sun setting over a Polynesian island. Tahitian contains highest aroma profile of vanilla yumminess. Vanilla evokes beauty and delight and is excellent for body, head, hand and cuticle massages. Ylang Ylang Essential Oil (Cananga odorata) – While others sleep, this Flower of Flowers, Ylang Ylang exudes its exotic fragrance across tropical breezes. Our organic Ylang essential oil is steam-distilled in the verdant lushness of Nossi-Bè, Madagascar. The heady, sweet aroma is long-lasting and inspiring, conjuring experiences of balance and beauty. Ylang means “flower of flowers.” Its cheerful, floral fragrance kisses the cheeks and invites radiant skin to come out and play. This amorous oil balances oil production in all skin types, harmonizing the skin you’re in with pitch-perfect moisture. 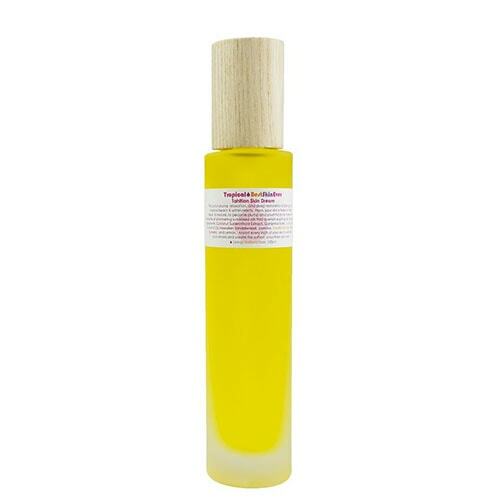 Turmeric Essential Oil ( Curcuma Longa ) – Treasured turmeric is a tonic of golden-goodness for skin. Through supercritical extraction, all of turmeric’s lipophilic (oil-loving) compounds are captured from the plant’s roots. This special extraction process captures much more of the aromatic volatile oils, lipids, and pigments than a typical powdered herb. Lemon (Citrus limon) – Luscious lemon clarifies, energizes, and purifies the skin from head to toe. It is excellent in cleansers for acne and bumps. Lemon tones, firms, and infuses skin with youthful energy and resilience. Cocos nucifera (Coconut Supercritical Extract), Gardenia tahitensis + Cocos nucifera (Gardenia, Tiare), Simmondsia chinensis (Jojoba), Cocos nucifera (Virgin Coconut) Oil, Santalum paniculatum (Sandalwood), Jasminum officinalis grandiflorum (Jasmine Grandiflorum), Vanilla tahitenis (Vanilla, Tahitian), Cananga odorata (Ylang Ylang), Curcuma longa (Turmeric), and Citrus limon (Lemon). Gardenia , Tiare Oil (Gardenia tahitensis infused in Cocos nucifera) – What happens when fresh Tahitian gardenia dances with the essence of pure, virgin coconut? Why it’s a Polynesian love-dream that is supersaturated with gardenia! This exclusive infusion is made by taking fresh Tiare and gardenia flowers and soaking them in the purest coconut oil from the South Pacific. The South Pacific coconut oil is drawn from fruit that grows in the shade of towering volcanoes, thus infusing the oil with all the nutrients found in the surrounding volcanic soil. This gorgeous gardenia infusion is created with a minimum of 200 Tiare flowers for every liter of pure, volcanic, South Pacific coconut oil. This fantasia infusion of flora assures a balanced fragrance that is not overpowered by coconut and highlights the sweet tuberose-like fragrance of Tahitian gardenia. Virgin Coconut Oil (Cocos nucifera) – Our pure, pristine virgin coconut oil satiates skin, offering magnificent moisture and resilience. Coconut oil is smoothes the appearance of fine lines, and is a sentinel for the skin’s moisture barrier. Jasmine grandiflorum Essentail Oil (Jasminum officinalis grandiflorum) -Jasmine grandiflorum is traditionally used to improve the appearance of scars, spots, and imperfections. This tantalizing tropical perfume adds a full bloom love liniment that lifts the spirits and ignites the heart towards love and happiness. Worries are scattered to the earth’s four corners with a single inhalation of this precious Poet’s Jasmine. Turmeric Essential Oil (Curcuma Longa) – Treasured turmeric is a tonic of golden-goodness for skin. Through supercritical extraction, all of turmeric’s lipophilic (oil-loving) compounds are captured from the plant’s roots. This special extraction process captures much more of the aromatic volatile oils, lipids, and pigments than a typical powdered herb. 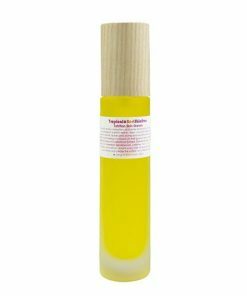 “I love using Living Libations Seabuckthorn Best Skin Ever; so when Living Libations came out with their Tropical Best Skin Ever body oil, I needed to give it a go. 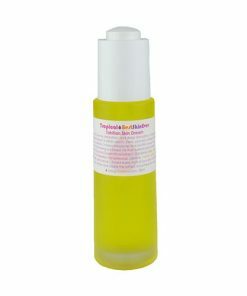 I soon discovered that Tropical Best Skin Ever from Living Libations is great for regenerating skin. Having another look at the ingredients which make up Living Libations Tropical Best Skin Ever, it’s no wonder it regenerates skin so quickly. “I just received my recent order. Firstly thank you kindly for the Living Libations surprise you included in my parcel. Lovely, and I only wish I could wander through a Living Libations sanctuary plucking heavenly Best Skin Evers, serums, Petal Perfumes and all manner of rejuvenating body ablutions from nature and deposit them in my L.L tote. The luscious tropical Shimmer B.S.E. (decadence for all the senses) is a perfect compliment to your gardenia perfume. I decided to get the petal pocket size from you so that I could always have it in my handbag – perfect for lifting the spirits on the run. THE SCENT IS ABSOLUTELY AMAZING! Nadine Artemis of @livinglibations has to be my favourite natural skin care formulator. The artistry of her essential oil blends and vast knowledge of her raw materials sets her line apart from any other brand I have tried. My bottle of Tropical Best Skin Ever is magic! This oil absorbs very quickly and leaves my face with a hydrated glow. The scent is absolutely amazing! I have studied essential oils in depth myself and her skill of capturing the feel and scent of the tropics with natural aromatics cannot be understated. Only 2 days I get this oil and I like it I love the brand really respectful of the body ! !